I recently had the pleasure of interviewing a Zionsville entrepreneur who is doing something very unique—and she’s doing it her way. 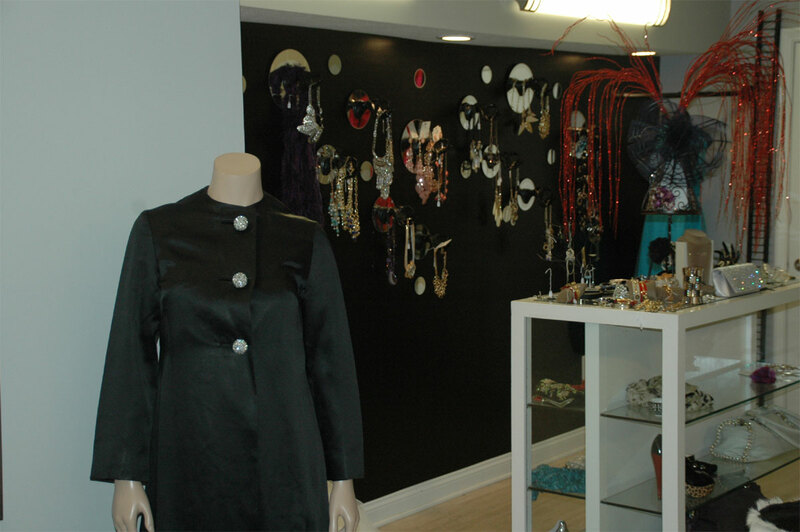 Nikki Blaine is a provocative fashion designer who started out in the drab corporate world of business finance and accounting, but landed in a colorful storefront in downtown Zionsville. Where she ends up is anybody’s guess. 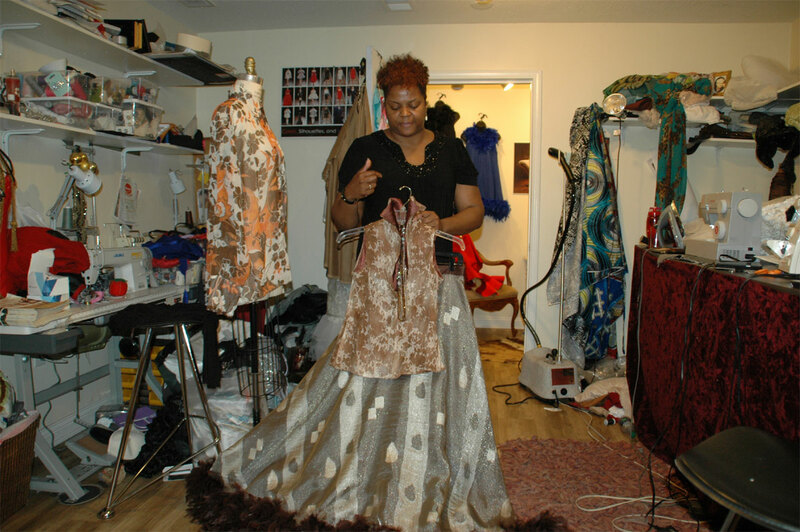 In addition to being displayed in the Indianapolis Museum of Art, Nikki’s designs have been worn on fashion runways around the globe and seen at the Neighborhood Ball at the inauguration ceremonies for the President of the United States. 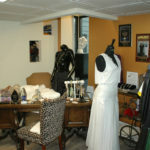 Nikki Blaine Couture (99 N. First St., Suite 100) is not your typical dress shop. 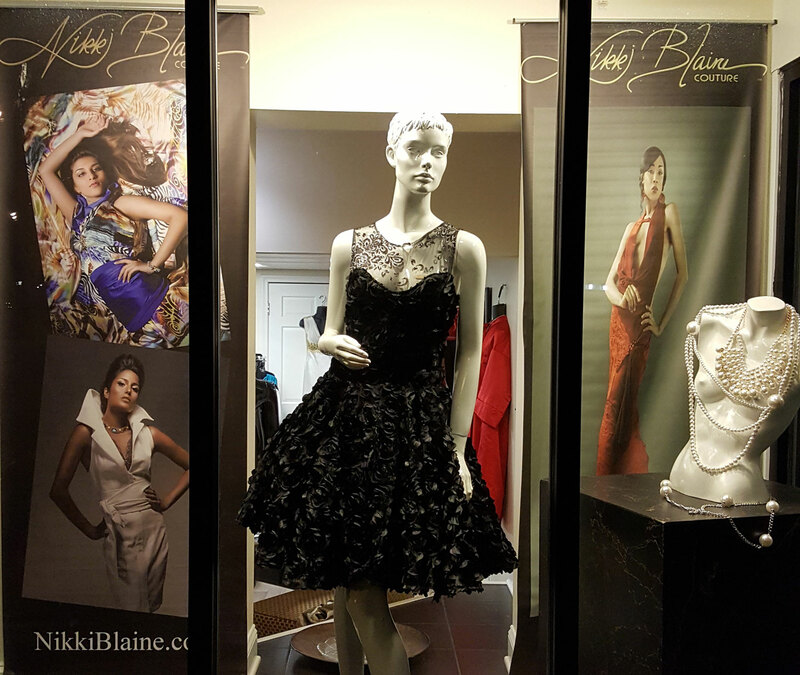 There are no racks of outfits from which to choose a standard style in a size that fits, because every dress designed by Nikki is a one-of-a-kind original that will set you apart from everyone else. I did not have any familiarity with the world of high fashion, other than what I’ve encountered in the media, so I was apprehensive about interviewing Nikki. I felt a bit uncomfortable when I entered her shop, because I was not sure of exactly where to go with my line of questioning. But, like the trajectory of her life and career, once you get Nikki going, there’s no stopping her. 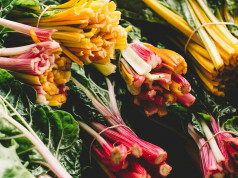 Here are some of the highlights of my recent conversation with Nikki Blaine, MBA, MFA. Ken Zweigel: Where did you grow up? Nikki Blaine: I’m from Indianapolis. I graduated from North Central High School in 1993 and I’ve had a passion for fashion since I was a child. KZ: What was the first moment you recognized fashion as an interest? NB: My first interest was watching my mother get dresses to go to work. She would apply her make-up and get her clothes nice and crisp. I would just sit there and stare at her. She would tell me not to touch anything and as soon as she would leave I would go through everything that she just did. I was always plying dress-up in her closet. The second time that made me aware of my interest in fashion was when I was in middle school. I was making a sweatshirt for a class project and all of my friends in the class could not figure out how to make one—everybody’s sweatshirts had mistakes. So, I took them all home and fixed them, because I wanted all of my friends to do well. I know it was cheating, but I wanted to help everybody fix their mistakes. That’s when I realized I really liked sewing, so I asked my mother for a sewing machine. I said, “I promise I’ll use it.” I used that Singer sewing machine from high school until I was in my fourth year in college, when it finally died. KZ: When did you make a connection that you could turn your passion into a job? NB: In my first year of high school I was taking a Clothing 1 course and my teacher told us we could decide what our first project would be. I told her that I wanted to make a fur coat. She thought that was very ambitious and said the only way I could make it was if I would come in early before class—before school started—to work on it. So I did that. Then I started doing research and realized I needed to figure out what system I was going to use, so I was getting paid for my time. The connection started in high school… I made something and everybody loved it. KZ: What kind of fur did you use? NB: It was a faux-fur. There are some really nice quality faux-furs that look almost real. KZ: Is that when you developed an interest in different types of fabrics? NB: I realized early on that the quality of the fabric speaks volumes about how the final product is going to look. I love mixing textures. When you seeing people touching the products, it’s all about the quality of the material that it’s made of. KZ: What other elements of a garment make it a really nice piece as opposed to something of lesser quality? NB: The detailing; how it’s made; how it’s built determines how it lasts. 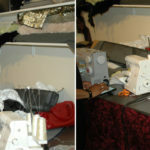 How the seams are finished—I prefer French seams, which takes an extra step, but it really finishes the garment. This day and age, with fast fashion in our industry—things cost a quarter to make and they’re selling it for 10 bucks—those clothes are poorly made. You can turn it inside out, pull a string, and the whole thing falls apart. A finished seam—a finished foundation—really secures and locks the quality of the garment. Something can sit for 50 years and it will still be a fashionable piece to wear, because it was made well. You’ll find those types of things in a museum, like the higher-end designer names—they tend to finish their garments impeccably well. KZ: Were there any designers that you wanted to emulate? NB: Interestingly enough, Bill Blass. The Indianapolis Museum of Art had this display of 19 Stars of Indiana Art who were either born or raised in Indiana, and Bill Blass is one of those designers. I took a special liking to him when I was in high school. 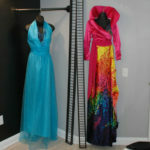 One of my first projects that I felt was of couture status was a Bill Blass suit. It was amazing! 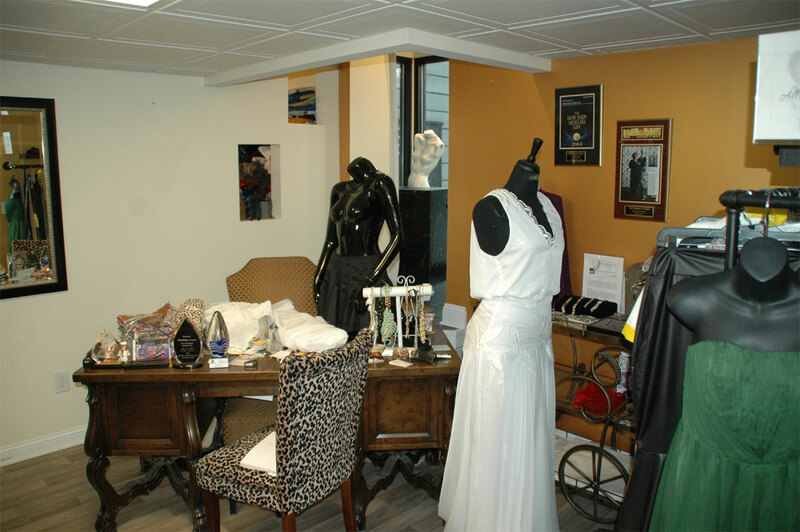 Bill Blass was born in Fort Wayne and he has a phenomenal story, so I kind of followed him in my early years and learned to respect his process and how he became well-known in the fashion industry. In 2016, to be recognized and acknowledged for reflecting his work in my work was an amazing experience for me. I was asked to compare from the past to the present how my work in the fashion industry was inspired by Bill Blass and to retrospect my design. It’s actually on display until 2017 at the Indianapolis Museum of Art. From what I could see of him, he was just a sharp, classy man—debonair. I loved his style outside of fashion. KZ: What is your definition of style? NB: My definition of style is your character and how you possess your ability to walk the look. That’s what style is to me. And then what you wear just helps your style come to life. It has a lot to do with your character. How you feel on the inside is projected on the outside, regardless of what you’re wearing. For me, integrity is very important. Having passion and respect, and being trustworthy. In regards to being a business person and pleasing my customers, I want to make sure they walk away feeling that same way. They trust me, they’re passionate, and they’re confident with what they’re wearing when they walk out. All of that is embedded in that garment. So they can’t help but to be fabulous and feel enriched and empowered, because all of those good seeds have been planted in my process of treating their sense of fashion. KZ: Let’s go back to your education. After high school, where did you go next? NB: I was a strong athlete, so I had a choice between a basketball and a track scholarship. I felt basketball provided more of a foundation in case I was injured—and that ended up being the case. I went to the Indiana Institute of Technology, in Fort Wayne, for business marketing. They convinced me that I need a business education to be able to run my own business in the fashion industry. I wanted to travel to New York and study fashion, but as I was doing my research I learned that a lot of designers were failing in the first couple of years and they ended up closing their shops, because they just didn’t have the business savvy to understand that side of the industry. A creative person is not normally an accountant—those are two different people and rarely do you mesh the two together—but that has happened to me. I was majoring in marketing and had to take all of these dreadful accounting classes, so I thought I might as well get an associate’s degree in accounting. I had stacks of fashion books—if you step into the other room you’ll see some of them. I started taking classes and all of a sudden I was thinking, “Maybe I just want to design a fashion computer program.” So I started taking Computer Information Systems classes and realized that was a little too stiff and rigid for me. I was just two classes shy in that program, so I ended up graduating with a bachelor’s degree in marketing and an associate’s degree in accounting. During the summer, I thought I probably should go back and get my master’s degree, so I immediately enrolled back into Indiana Tech, to earn my MBA in Entrepreneurship and Human Resources. Then I was temping, because I was trying to figure out what my next move would be. I was working at Quaker Oats as an accounting assistant. It was a three-month assignment that turned into two years. I told them, “If you’re not going to offer me a permanent position, I’m going to leave.” I left and six months later they offered me a full-time job. I became an accountant in Indianapolis—and boy did I really not enjoy being an accountant, but I was driven by the money. It was a combined seven years all together. In the midst of working for them, I was still designing on the side. I was participating in any fashion shows that were happening. There are a lot of hair shows that go on in the city, so I was always making costumes for the different hair stylist teams. I was doing small random projects and being consistent about wanting to be a designer. I found Etsy, which is like an Ebay or Amazon for hand-made items. I created an account and started posting images there. I started sending things to Washington, D.C. and Seattle and California and other places. I thought, “People like my stuff. How are they even catching it?” But, it’s like the search engines, you type in the right words and things start popping up. 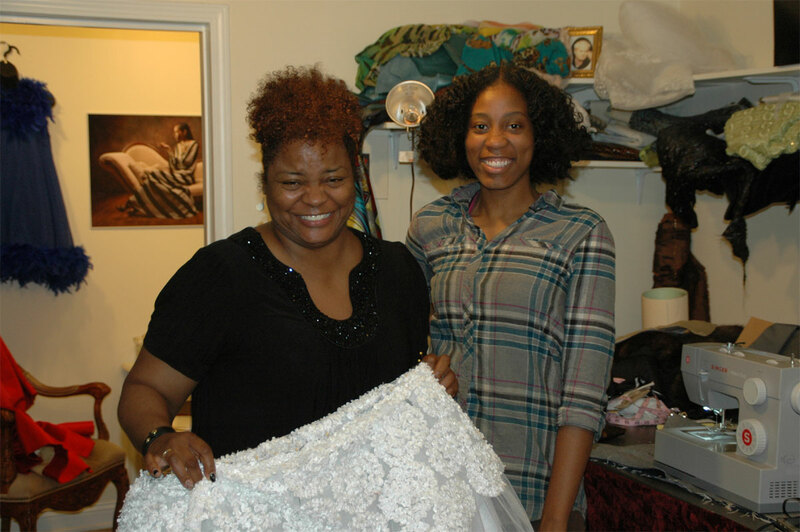 Then I was getting repeating customers who’d say things like, “I want that dress you made for my niece.” So that really starting picking up my business. KZ: What year was this? NB: Around 2005 to 2007. KZ: You started posting sketches on Etsy? NB: No, they were photos of finished products that were on the runways. At the runway shows, photographers were always taking photos, so I would ask them for copies and post them. And it was working for me to the point where I was in the newspaper quite frequently. Then it got so busy my co-workers knew I was up all night when I had a Mountain Dew on my desk. It was really funny, because they wanted to know about my latest creation—to bring in some pictures, so they could see how it looked. Some of my coworkers said things like, “You’re going to make my wedding dress when I get married.” People were following what I was doing. “Oh, I hadn’t even noticed. 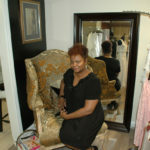 I hadn’t seen it.” It was this ginormous article in the Indy Star about fashion and they had a picture of me and a picture of one of my gowns. Then corporate execs would come to the plant and ask, “Where’s the fashion designer?” We’re counting cases of Gatorade, Tropicana, and Propel, so I didn’t understand why they knew what I did. It made me wonder if I was pigeon-holed because they’re thinking that I was getting ready to leave real soon. It was making me mad, because I really wanted to stay and progress with the company. The job was paying well and fashion was just a hobby, but I felt I couldn’t go any further because they saw me as a fashion designer. Well, I saw myself like that too, but I was kind of scared. I thought about it and she was right. I didn’t want to sit there for 20 more years. I didn’t even want to sit there for 20 more days, actually. I started thinking about coming up with a strategy to exit out of corporate America. It was challenging, because at the time I was married with two kids and I didn’t think it would be a smart idea to step out on faith. KZ: Did your husband support the decision? But what happened was my mother got dreadfully ill the same week that I turned in my resignation letter. I thought I had made a horrible mistake. She ended up with a heart transplant in 2009, so all of 2007 when I’m getting ready to be Nikki Blaine Couture the fashion designer, I was Nikki Blaine the nurse. I was running my mother back and forth to doctors appointments; getting whatever she needed. She had something that attacked her heart. We had no history of heart disease in our family, so it was a shock and a blow to everybody, because we were in the process of remodeling her house to sell it. We had to stop that and start tending to her health. I was so nervous, because she was the rock of the family and now the rock was turning to little pebbles that I was going to have to scoop up and make sure it stays whole. She’s still living today, but at that point I thought my world was coming to an end. I didn’t know what to do, because you don’t plan for someone getting traumatically ill in the blink of an eye—and that’s kind of how it happened. What I thought I was going to be doing, I wasn’t doing. I thought I was going to be working and building up my little fashion empire, but that whole year I maybe made only five or six garments. I really just had money to pay the mortgage and make sure everything stayed on. I ended up not having the resources that I thought I was going to have. I was just going to have to make it work. Eventually my mother was kind of steady to a point where I was able to start working again. Then things started picking up again and the ball started rolling. KZ: This is around 2009 to 2010 when the ball started rolling again? My kids were young—they’re just 13 and 15 now—and it was easy because I really didn’t have to worry about daycare too much. But when they were pre-school ages, I made sure they got into pre-school. I was just working and sewing and doing whatever I could possibly do from home. The clients were coming in. They loved the experience. I always made sure it was very hospitable. 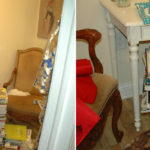 “Have a seat. Would you like a drink? Do you want some water, or cookies and punch?” I always tried to make them relaxed and comfortable. They could watch TV while we had our sittings or we had a little side conversation. They just enjoyed the ambience. KZ: You were still in your loft in Indianapolis? NB: Yes. It was on the far Eastside, in Cumberland almost. Far far east. But people were coming to me. I would just work around the clock. 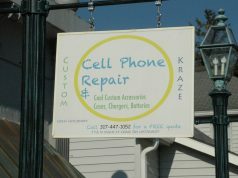 KZ: How did your customers know how to contact you? NB: It was literally word of mouth and from doing fashion shows and networking. Every time there was a fashion show, I was in it. If there was a hair show, someone would say, “I know who can do that for you.” If someone needed something done at the last minute, “I know who could do that.” That’s just how it was. Literally word of mouth. KZ: Did you still have the Etsy website? I didn’t know who they were, but Channel 6 was interviewing them about their invitation to the inaugural ball. Mike said, “My wife doesn’t have anything to wear. I’ll just pick up a tux in D.C., but Cheryl doesn’t know what she’s going to do.” I was laying on the couch and thought, “She could wear a Nikki Blaine Couture piece.” Then I rolled over and went back to sleep, because it was around six o’clock during the early morning news. She said she had about five or six things to choose from at home, but something was wrong with every one of them—one’s too short, one’s too long, or the sleeves weren’t long enough. 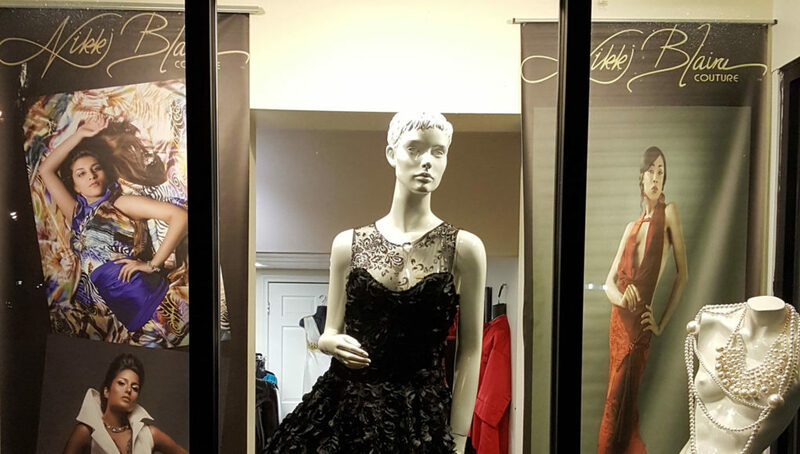 I managed to piece her dress on the mannequin, how they would see it, but it was not put together. She ended up with the dress and looked fabulous. On Channel 6 they did a follow-up and you could see she was on stage with Barak and Michelle—they were doing the bump at the inaugural ball. There was also a nice write-up in the newspaper and they interviewed me. It was just one of those monumental moments that kind of shifted everything, because then everyone knew I made this dress for one of Barak’s VIPs. 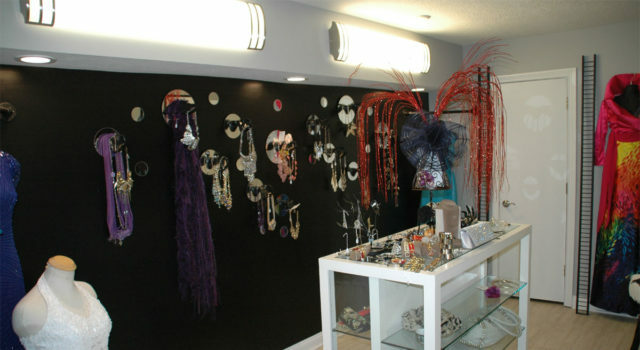 That shifted energy to where a lot of people started coming to me for formal pieces, which is what I love to do anyway. 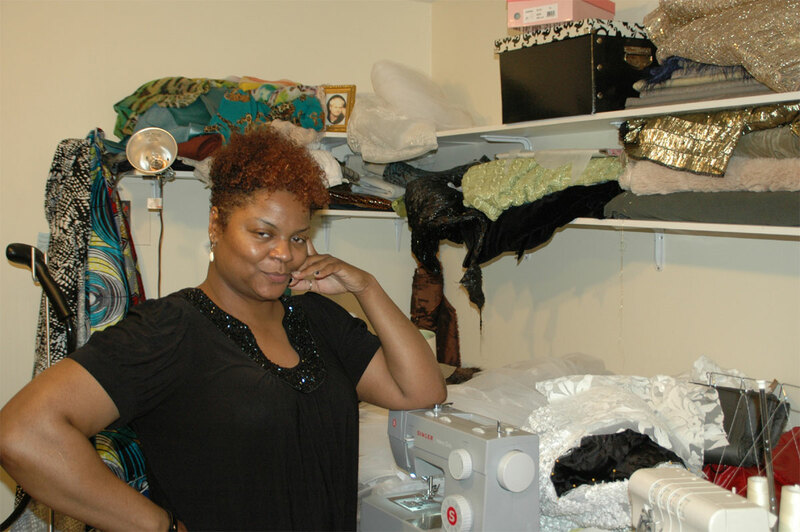 But I wanted to show my versatility, so I was making swimsuits; evening gowns; dresses for birthdays, Sweet 16s, proms—and that’s just what I love to do. Come to me because you want something different. You’re going to look stunning and remarkable and people are going to remember you—that’s why you come to me. If it’s something plain, I don’t want to do it. And that became my reputation. 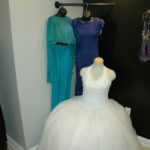 If you want to be the belle of the ball, you come to Nikki Blaine Couture. The transcript above only accounts for the first half of my conversation with Nikki. As I stated, once Nikki gets going, there’s no stopping her. The rest of my interview covered other topics, including how her creations have been worn at the Oscars and the MTV Music Awards. 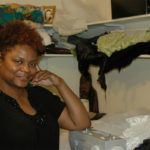 We also discussed some of designers who influenced her approach to fashion. 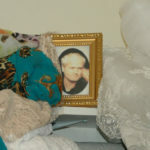 Gianni Versace heads the list—she has a small framed photo of him in her workshop. Others on her influencers list include Balenciaga—because his structures are simple, clean, sophisticated, and classic—as well as Alexander McQueen, who was flamboyant with a sense of theatrics and a dark undertone. As far as her own style goes, Nikki gravitates to animal prints and she likes to mix textures and build layers. She also likes feathers, fur, sequins and shear lace. As if all of that isn’t enough, Nikki is also a part-time instructor at Harrison College, where she teaches two courses a week. 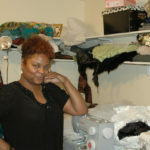 Nikki also nurtures and helps to develop aspiring fashion designers through an apprentice program. 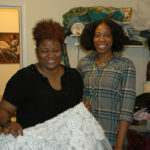 During our conversation, a current apprentice, Aisha Riley, arrived at the shop to help Nikki finish a dress. Nikki’s long-term plan is to have a larger manufacturing presence in Central Indiana, with a team of about ten people on staff, including some home-based sewers. 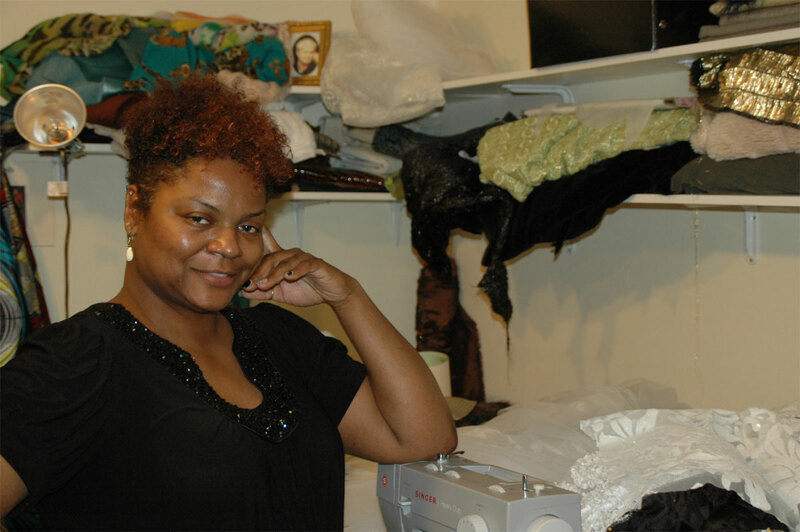 One of the challenges she faces is that there are only four schools with fashion design programs within a 150-mile radius of Indianapolis, which is not yet known as a fashion center. Her ultimate goal is to be a world-renowned brand. We suspect she’ll eventually accomplish that. 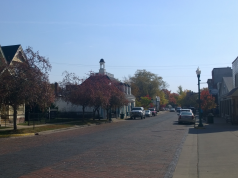 In 2011, Nikki moved out of her loft in Indy and she opened her shop on the second floor of the Potpourri Building on N. Main St. in Zionsville. Three years later, she moved downstairs in the back of the building, after convincing her landlord to install a window display that faces the street. 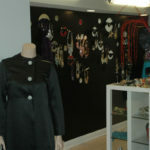 You can see Nikki’s unique creations at 99 N. 1st St., near the intersection of W. Poplar St.
Nikki Blaine Couture also features the “Designs by Onye™” jewelry and accessories collection. Be sure to stop in and say hello when strolling through the downtown shopping district—but remember, if you start a conversation with Nikki, be prepared to stay a while.